Maybe it’s the jet lag (I’m in Austria at the moment). Maybe it’s the pace of things for me right now, but as I think about what to post today there’s only one thing that really seems to matter. After a year of regular weekly posts, I’m going to be stepping away from the sweetest gig I’ve ever had: writing the blog here at BlueCatMotors.com. It’s a sad thing for me. Life is taking me to Chicago in a couple weeks, and while I’ll still occasionally post here from time to time, the regular task of keeping the world up to date on the week-to-week here at BCM will have to fall to someone else’s capable hands. While I think we’ve found that person, it’s still bittersweet to hand over the reigns. It hasn’t just been fun to write here, it’s been fun to all but live at the shop. It’s been a blast to get to know the people of BlueCat, the customers and all the groovy machines that have gone up and down on our lifts. I’m going to miss it something fierce. 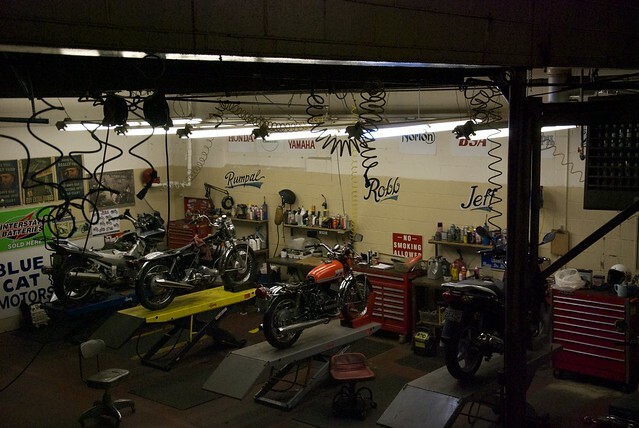 This motley group of guerilla motorcycle mechanics, artists, dreamers and lovable misanthropes have become brothers in arms — wielding wrenches and carb cleaner in the ongoing fight against atrophy, rust and neglect. There is no Endangered Species Act for old motorcycles. There are only people like Ryan, Jeff, Robb and Rumpal (the other Jeff) left to conserve these old machines for those who care enough to keep them in the wild. It’s noble work that they’re doing very, very well. So looking back, I’m grateful. Grateful to have been a part of this place for so long. Grateful to have learned so much about motorcycles and the people who love them. Grateful most of all for readership. This little corner of the internet shouldn’t get much notice, yet time after time some of you have found me at the shop and told me how much you appreciate what I’ve written here. Thank you for that. It really means a lot. Hand in hand with gratitude is also sadness. I’m sad to go. Sad to disconnect from from such a fun place doing such great work. But hell, I’m sad for more practical reasons too. Now I have to find a good bike mechanic in Chicago. You’re spoiled, Twin Cities, whether you know it or not. Keep bringing your machines to BlueCat Motors.